We are very honored that generous friends of the fire service have given us the ability to have 5 fully stocked response trailers. 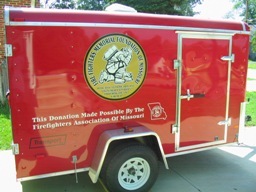 These 6X10 trailers are stocked with most items a department will need to assist with the funeral ceremonies. All items are available for use for any firefighter funeral, with priority given to LODD type of ceremonies. Please contact us for information on using these response units. 10 Detail Officer Arm Id Bands. Click on this link to see the items available for optional purchase from our team. Also, we are a dealer for Liberty Art Works products. Items purchased through us help support our team.